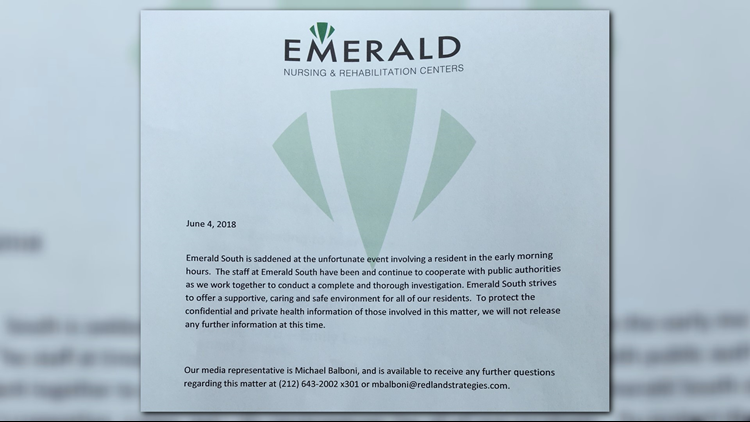 Emerald South Nursing Home is being investigated by both Buffalo Police and New York State Department of Health after 87 year-old resident died while trying to climb out of his third floor window. BUFFALO, N.Y. — A Buffalo nursing home is now the focus of a number of investigations after one of their residents died early Monday morning. It happened early Monday morning at Emerald South Nursing Home on Delaware Avenue. Investigators say 87-year-old William Strasner tied clothes and bed sheets together and attempted to climb out of his third floor window. At 6 a.m., Buffalo Police received a 911 call from a staff member who found him lying in the parking lot, when she was coming into work. Investigators determined that Strasner meant to climb down his makeshift rope but instead fell 34 feet to the ground. Buffalo Police Captain Jeff Rinaldo says the focus of their investigation is to find out how it's possible that Strasner got out of the window in the first place. He explained that there are security devices bolted onto most of the windows at the facility which prevent them from being opened more than seven inches. "That device did not appear to be functioning on this window," explained BPD Captain Jeff Rinaldo. "So, we're looking at whether or not the nursing home was aware of that and how that device may have been removed." 2 On Your Side asked Capt. Rinaldo how long investigators believe Strasner was lying on the ground before somebody found him, "You know, it would be a guess at this point? But it doesn't appear to be an extremely long period of time. 20 minutes is what we've kind of narrowed it down to." Strasner died on the way to the hospital. We're told he had been a resident of the nursing home for "some time," but BPD couldn't say exactly how long. He apparently had his own room, and staff told investigators they had checked on him 30 minutes prior to the fall. "That's part of what our investigators are working on right now," admits Rinaldo. "is how often they check the patients in their rooms...how often rounds are made...those types of things." According to NYSDOH's latest numbers, Emerald South Nursing Home has four times the number of complaints and citations over the state average. On a scale of one to five, the U.S. Centers for Medicare & Medicaid Services ranks it a two star facility, "below average." 2 On Your Side reached out to Emerald South Nursing Home for comment. Our calls didn't make it past the receptionist who said they have no comment.